Considering JLU’s expansive cast of characters, it’s a bit disappointing when the show focuses on the original members of the team. It’s spent so much time with those heroes already, why not devote some attention to the less familiar faces? A team-up between DC’s trinity of Batman, Superman, and Wonder Woman may not sound like the most exciting narrative prospect, but writer Dwayne McDuffie understands this and elevates “Dead Reckoning” by switching up the hero dynamic with the inclusion of a spectral fourth player—Boston “Deadman” Brand—and adding a delightfully wacky twist in the final act. Continuing season 3’s exploration of the more obscure corners of the DC Universe, “Dead Reckoning” introduces Deadman and the immortal city of Nanda Parbat to the DCAU for a story that embraces the mystical elements of this world. The Legion Of Doom has come to Nanda Parbat to steal the spiritual energy from its population of monks, energy that Grodd plans to use to create a devolution ray that will turn every man, woman, and child on Earth into an ape. It’s the kind of plot that you’d expect to find in a Silver Age comic, full of nonsensical science that doesn’t actually mean anything, but makes it possible for the script to move into increasingly silly territory. And this episode gets silly. JLA: Gorilla Warfare! was a crossover event published across different DC Comics Annuals in 1999, and it looks as though McDuffie was a fan because everyone gets turned into an ape when Grodd turns on his devolution ray. It’s totally ridiculous, but JLU’s willingness to not take itself too seriously is a huge part of its charm. This is a show where goofy stuff happens sometimes (remember when Wonder Woman got turned into a pig? ), but if you have a universe where anything can happen, why wouldn’t you embrace that freedom to explore any creative impulse, no matter how outlandish? 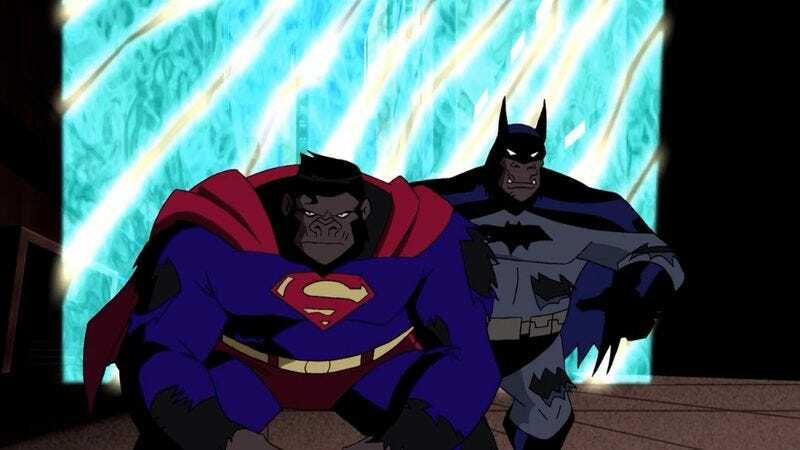 This episode has the Justice League uncovering the truth behind the Legion Of Doom, but they uncover that knowledge in a story that begins with Superman getting possessed by a ghost and ends with the Leaguers turning into gorillas. It’s the kind of fanciful narrative that you don’t see much of in contemporary superhero comics, which are much more concerned with bringing an element of realism to these stories about gods and aliens and people that fight crime in bright costumes. That’s not the case with JLU, which is thinking further and further outside the box as it continues. And as it does so, it becomes more entertaining. Boston Brand’s possession powers and the gorilla transformation bring a lot of humor to the story, the former by changing character interactions on a dime and the latter by turning everyone in an ape, which is always going to be funny. While season 2 had a stronger overarching narrative, season 3 did considerable work expanding the scope of the DCAU, and who knows where it could have gone if it continued past this season. It’s easy to imagine the writers incorporating more and more fan-favorite DC characters—I would have loved to see this show tackle the Doom Patrol and Kamandi—and considering the consistently high quality of the series, it’s potential to bring the breadth of DC Comics history to the screen is unlimited. Not only that, but the visual style of the show is very flexible, able to adjust for any genre while still maintaining a classic superhero look. One of the things that gives this show a retro feel is the color palette, which embraces the kind of bright, bold shades that you’d find in a Silver Age comic. The DCAU house style, with its strong lines and simplified designs, takes thick chunks of color especially well, and this episode uses those vivid hues to intensify the atmosphere, particularly in Nanda Parbat. The city is predominantly colored with shades a blue, creating a chilly environment that is fairly ominous and haunting, the perfect home base for a superhero ghost that can possess living people. All of the characters in Nanda Parbat are colored with warm shades to make them appear full of life in a dead climate, even if they aren’t corporeal. The monks and Deadman’s master wear orange and yellow robes, Deadman is in his red costume, and the spirit Rama Kushna is a bright pink that reinforces her otherworldly nature. “Dead Reckoning” isn’t a standout like last week’s episode, primarily because it’s missing a strong emotional core, but it’s an episode that shows how fun JLU can be and how expansive its scope is. From martial arts action in Nanda Parbat to sci-fi shootouts in Gorilla City, this episode moves fast and unpredictably, ending with some major events for the season’s larger narrative. The Justice League is now aware of the existence of the Legion of Doom, but they’re still behind in the game because they think Grodd is in charge of it all. He is, until Lex Luthor finally decides to turn against his ape oppressor and claim his place as the leader of the Legion of Doom. The final development is great for two reasons: First, it reestablishes Luthor as the show’s supreme villain by having him make the power play that he’s been planning since he joined the Legion of Doom, creating a lot of tension within the group as a result. 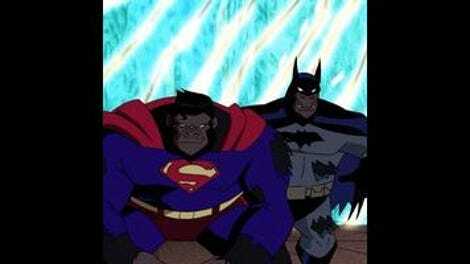 Second, it plays into the absurdity of the episode’s story, with Luthor using Grodd’s devolution ray as the major reason for going forward with his mutiny ahead of schedule. What kind of foolish plan is that? Turning people into apes may make for a very enjoyable chapter of a superhero cartoon, but it’s still a stupid supervillain strategy, and Lex Luthor will not abide this kind of foolishness. Deadman first appeared in the Batman Adventures comic book, and this episode actually calls back to those events as Boston recounts his history with Batman. I remember reading that exact issue in a Waldenbooks back in the day, although I don’t remember much of what actually happened in the story. I’ve always had an affinity for the Deadman costume. Red is my favorite color, and I’m drawn to predominantly red costumes (Daredevil is another favorite), but Deadman’s collar also adds a dramatic flair to the look that contrasts really well with his wan face. Rampage’s proportions are crazy. She must be superpowered if she’s able to walk with that giant chest on top of a tiny waist. Juliet Landau does double duty as Tala and Rama Kushna, and it’s fun to hear her do two very different types of mystical female character: the evil one has a more pointed voice with an indeterminate Eastern European accent, while the good one has a more open sound with a soft British accent.